The idea for Twine jewelry originated in the ‘70s, when I was studying Industrial Design at the TU in Delft. 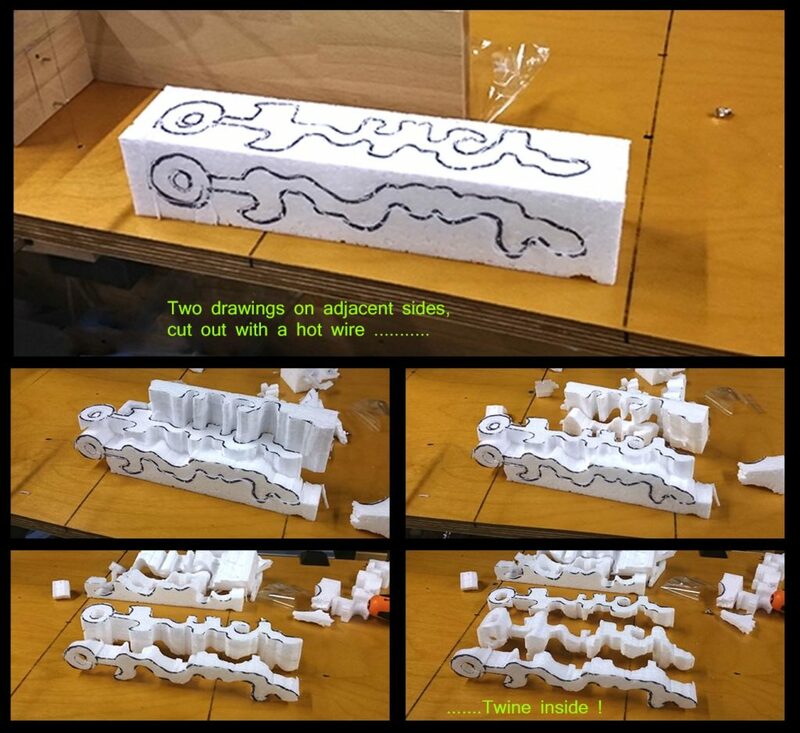 I was working on a 3D shape, using Styrofoam and hot wires. I noticed that the two perspectives a shape could be looked at, meant that I could combine two different words or names. They would each be legible from a different angle. The techniques at the time didn’t allow these shapes to be made digitally, let alone on an industrial scale. The modeling with materials was very labor intensive. Everything needed to be drawn and worked out by hand. The development of 3D drawing programs in the last decade has provided me with the opportunity to re-use my old ideas for 3D shapes. No longer do I have to draw complex 3D shapes by hand, but now I can use modern software to help me with the right design. I’ve been using and learning more about drawing software since 2012, which allowed me to develop my old idea of combining two words or names into one object. I named it a Twine. At the same time, possibilities for 3D printing arose, making the process even better. Several companies took the lead in 3D printing, like Shapeways, which has become the world’s largest 3D printing company. As designing software developed, and I used it more and more, I thought about how great it would be to have customers create their own designs. By developing an app, I would give the customers the opportunity to enter names or words, and choose materials. I could render a preview and let them discover the magic of visual possibilities. In 2014, Sietse Dijkstra * and I developed that app. The app allowed people to enter two texts online, to make a small nylon block, called a WordFlip. The block had two viewpoints; one side for one name and another side for the other. This app is used on the websites www.sparenberg.nl or www.sparenbergdesign.com. The WordFlip app was added to the worldwide website of Shapeways fairly quickly. Many visitors started using the app. By now, about 2000 WordFlip models have been generated. The Twine app was developed based on the WordFlip app. When I wanted to make a unique piece of personalized jewelry for my girlfriend, I added an eyelet to a WordFlip. Suddenly the decorative nylon block got a whole new purpose; it became a pendant. In 2015, Sietse and I developed the new Twine app. The new app made the preview much more realistic and easy to rotate. Now, the whole world can order a Twine pendant via the Twine website. The idea to combine two names or words in one piece of jewelry has never been done anywhere in the world before. Besides the design itself, the software is also unique. The realistic preview is unparalleled. New designs are being made and soon earrings and rings will be added to the collection. All of these designs incorporate the same special design of the combination of two words or names. * Sietse Dijkstra is one of the programmers of Ambrasoft, a self-correcting software program for children in Dutch elementary schools. Sietse is working with 5 other engineers from different countries on a revolutionary system for defense worldwide. The system was presented to president Obama in 2015 and is being tested in the U.S.
← The most creative necklace design: how do we make it?